With Halloween coming up upon us in a couple months’ time, it is never too early to prepare. 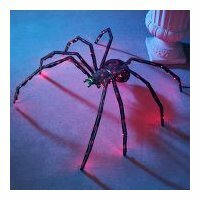 Enter the 36″ Twitching Lighted Spider to help add that Halloween charm to your home as kids drop by, asking for treats and tricks. This spiders eight illuminated legs span 36″ in diameter, four of which move slowly to create the simulacrum of careful, calculated movement as if stalking prey. The spiders thorax and abdomen conceal a stealthily quiet electric motor that drives a system of levers attached to the two front and two rear legs, creating a semblance of life as the legs twitch back and forth while the abdomen slowly rises and falls. Each leg is decorated with a string of incandescent purple lights rated for 1,000 hours of use; the spiders pedipalps have green lights. Made of a powder-coated steel frame, the body and legs are coated with 1/8″ long jet black flocking. This AC-powered spider will retail for $69.95, and while it might not snack on pesky insects, it doesn’t leave around trail of cobwebs either.